Welcome to this week's edition of Maritime Monday. You can find Maritime Monday 2 here. UPDATE: Senator John McCain will be the keynote speaker at the graduation of the US Merchant Marine Academy's Class of 2007 on June 18th. These are photos of the Ceres Paragon Terminal. Take a look at this first photo. The interesting part is that they are working at least three adjacent hatches. To be able to do this, they had to put container cranes on both sides of the vessel. 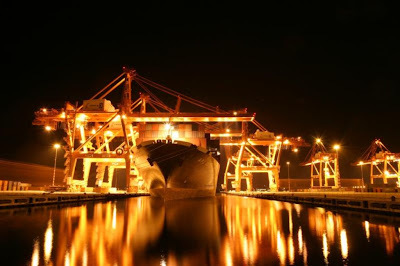 You see, the cranes are wider than the hatches, in order to permit the containers as well as hatch covers and oversized cargo to pass through the crane's legs. This means that in general, you must have one hatch separation between working hatches. An additional benefit of using terminal space on both sides of the vessel is that you reduce traffic alongside the vessel which can also benefit production. More photos of the terminal can be found here. This terminal is located in the Port of Amsterdam. 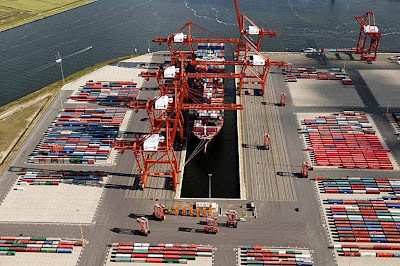 As you all know, the big container port in the Netherlands is Rotterdam. This has been a problem for the terminal in getting business, as can be seen by the bottom photo, which is clearly nowhere near capacity. Ceres is owned by NYK. Eagle Speak has a last minute delay to what should have been the first day of enrollment for Transportation Worker Identity Cards (TWIC) at the Port of Wilmington, Delaware. Not surprising at all really. There was US Senate testimony given in May, 2006 about TWIC Problems as observed in the Port of Wilmington. Check out Maritime Monday 10 for a summary as reported back then. Sailors, Mariners & Warriors League has the sinking of the M/V UNICORN ACE in the Philippines. UPDATE: EU Referendum has analysis and questions over how the kidnapping of the British boarding team might happened, noting that the Royal Navy has only one Frigate in the area, making it basically impossible to have a larger military asset watch the backs of all their small boats. (With photos for illustration.) So who was watching their backs? The Stupid Shall Be Punished has some details concerning the possible cause of an explosion on the HMS TIRELESS while under the Arctic ice. Daily News (Sri Lanka) has a serious look at the terror threat to India's vast coastline. Tim at Tims Times signs off his ship in Sweden and gets reacquainted with life ashore. Be sure to take a look into his archives here where he gives you a little insight into sailors. The Japan Times has suspected smuggled clams in violation of sanctions against North Korea. The Hamilton Spectator has a story on the Canadian Coast Guard Icebreaker GRIFFON in Lake Erie. Scandinavian Shipping Gazette has Ice Navigation. Victoria News has a story about British Columbia, Canada pilots. Forbes has Waleed Mohammed bin Attash's confession to Planning the USS COLE bombing. That should be enough for a military tribunal to convict and sentence him to death, preferably by hanging. That is what General George Washington would have had done to him. The Globe and Mail has one year after the sinking of the QUEEN OF THE NORTH ferry in Canada. Marex Newsletter has coverage of the Panama Canal expansion. The North Devon Gazette (United Kingdom) has the Ilfracombe Sea Cadet unit's desperate need for a new commanding officer, instructors and volunteers. The Pilot Boat has 'Visual Aids to Navigation'. Fogonazos has coverage including video of the research platform R/P FLIP, "the only ship in the world having the ability to flip from a horizontal position to a vertical position while at sea". Navy Newsstand has video of the new USS MONITOR Exhibit at the Mariners Museum in Hampton Roads, Va.
Saanich News has the news that the Canadian navy frigate HMCS WINNIPEG was one of the vessels targeted by USS BENFOLD sailor Hassan Abujihaad (Note: Abu - Jihad). KTAR.com has some of the emails he sent from his own US Navy email address while onboard the vessel as well as an email describing the task force's mission and weaknesses in defense. General Washington would have had him hanged as well. We are extremely lucky that he did not try to sabotage the vessel from within. Of course, when given a choice and with all other things being equal, a sailor will choose a shipping company that treats it's sailors better. So this makes me wonder if V Ships has other seafarer issues that it needs to address other than low pay. Please submit articles for inclusion in next week' edition using the following submit form at Blog Carnival. You are also welcome to email photos for inclusion in future editions as well as suggest area of coverage. Send me an email (address in the sidebar) if you would like to sponsor an edition of Maritime Monday. I accept money and gear. Here or click on the label below 'MaritimeMonday'.